As a full-time blogger, I am on my computer...a LOT! Probably more than I realize or even want to admit sometimes. Unfortunately, my diligence on the computer has come with one major downfall. I have some serious pain in my shoulder and neck area pretty much constantly. This all began about six months ago, curiously enough about the same time that I started blogging. It took me a while, but I finally put two and two together. My shoulder and neck pain are actually being caused by the continuous use of my computer mouse, since it is only occurring on my right side. I knew I had to do something because this pain is starting to affect other areas of my life and changing what I can and cannot do. Thankfully, Smartfish Technologies gave me the opportunity to review their ErgoMotion Laser Mouse, a new take on the classic ergonomic mouse. Keep reading to find out whether or not it worked for me! I reviewed the ErgoMotion Laser Mouse from Smartfish Technologies, which retails for $49.99 with FREE SHIPPING. I have to admit that I was naturally intrigued by the ErgoMotion Laser Mouse since it takes ergonomic to a whole new level. 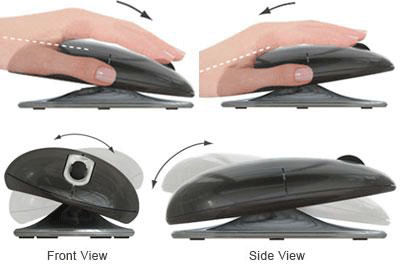 This mouse will actually move in ANY direction and has a revolutionary pivoting technology which will free your wrist from its stagnant position at your desktop. Smartfish has actually designed this mouse around what they call ErgoMotion, which means that the mouse will adapt itself to your natural hand and wrist movements instead of requiring your hand and wrist to adapt to the mouse's position. 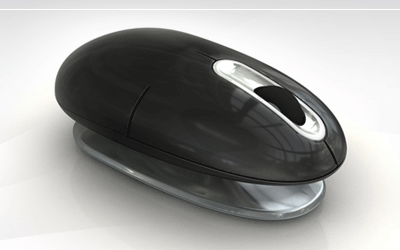 The result is a more comfortable and natural feeling mouse which will increase productivity and PREVENT injury. I tried it out immediately to see if it would help my shoulder and neck to feel better and I have to admit that I did notice much less strain on these injured muscles while using the ErgoMotion Laser Mouse. I've only been using this mouse for about a week now, but it seems to have already reduced some of the pain I feel in my shoulder and neck area. Unfortunately, because these muscles are injured, I believe it will take me quite a while to be completely back to normal. With the ErgoMotion Laser Mouse though, I know that I won't continue to injure myself any longer from improper posture and technique while using the computer mouse. This mouse isn't just ergonomic, it's also got a ton of features I love too. First of all, it uses an 800 dpi laser which ensures that it is responsive and precise and goes exactly where I want it to go on the screen. It's also wireless and has a very small nano receiver which plugs in to any free USB port on your computer or laptop. The ErgoMotion Laser Mouse is a two-button, completely ambidextrous device and offers 4-way scrolling for easy navigation. Finally, and to me, very importantly, this mouse claims to have a 10-month battery life on 2 AA batteries, which are also included. Boy, this mouse is officially my new best friend! Just check out the video below to see the Smartfish ErgoMotion Laser Mouse in action! Since everyone these days uses the computer in some way, shape or form, I think the Smartfish ErgoMotion Laser Mouse is a perfect present for EVERYONE! This mouse has a long battery life, is ambidextrous, extremely easy to use and can prevent painful injuries resulting from extensive mouse use. Give the gift of painless productivity this Christmas with the ErgoMotion Laser Mouse! Disclosure: I received the ErgoMotion Laser Mouse from Smartfish Technologies and Family Review Network in order to facilitate my review. No other compensation was received. This product review is based on my own personal experiences with this item and is completely honest and objective.